It’s another beautiful autumn in Summit County! As a Breckenridge Realtor, I love to see all of the fantastic events that are available throughout our area and if you’re looking for reasons to move to the mountains…here are a few. We have such an active, fun community and the many activities prove just how wonderful it is to live here. Take a look at this snapshot of the things you can enjoy this October. Ever wonder about the modern, wild west legends of Breckenridge? Now you can find out recent stories from the 1960s, ‘70s and ‘80s while also learning about the town’s gold mining history. On October 7th at 10:30am, be sure to come to the Breckenridge Welcome Center for this terrific Wild West Tour! Gear up for the ski season! You’re invited to the Summit Ski Museum in Breckenridge to celebrate the first 100 years of skiing at the Summit Ski Exhibit. You’ll see how skiing has developed over the decades in Summit County through this colorful history. Throughout October the exhibit is open Friday through Sunday; 11am – 3pm. Interested in billiards? The Lake Dillon Tavern offers an exciting Billiards Tournament every Thursday. Come see the most talented local players do their thing on October 16th at 7:00pm. If you want to join the games, you might even win a prize for your efforts! Get into the spirit of the spookiest season of the year! It’s a ghost hunt and walking tour that takes you to Breckenridge’s most haunted buildings. You’ll also get some juicy stories about the wild west at the same time. Enjoy the Ghostly Tales tour Monday through Saturday at 7:00pm. Fall temperatures are perfect for sipping some scrumptious spirits! Check out the Breckenridge Craft Spirits Festival Friday October 24th at 3 PM at the Breckenridge Riverwalk Center. You’ll have the chance to experience small-batch distillers, local cuisine and you might even want to attend an artisan spirit seminar while you’re here. Don’t be shy about sampling! You can have a taste of many types of brews throughout the weekend. If you want a real thrill on Halloween, head over to downtown Frisco for a Nightmare at the Museum. On October 30th at 4 PM, you can see some delicious scares at this creepy, most frightening place designed to provide an unforgettable time! 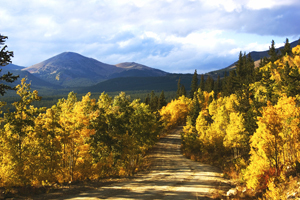 These are just some of the wonderful events you can enjoy in Breckenridge and around Summit County throughout the month of October. For more ideas, just check back with our blog. My Realtor team and I always enjoy offering you the latest news about fun activities in the area. Also, if you’re looking to buy or sell a home in Breckenridge, let me know. I can help you from start to finish. If you’re thinking of buying a home in Breckenridge, you can start by browsing the updated listings on my website. When you’re ready to talk through your options or schedule showings, contact me at any time via email ([email protected]) or on my office line. I look forward to working with you!